The UCCE Master Food Preserver program of El Dorado County started in 1983 and continues today with dedicated volunteers trained to assist the county UC Cooperative Extension staff provide up-to-date food preservation information. Our current program is active in El Dorado, Amador and Calaveras counties. What do UCCE Master Food Preserver volunteers do? Answer food preservation telephone and email inquiries throughout the year. Work in the community as local food preservation specialists. Staff information booths and present food preservation demonstrations at the county fair and local events. Write articles for the local newspapers. 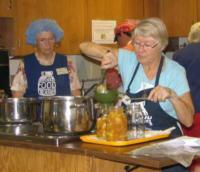 Teach classes on various food preservation topics. Test pressure canners - This should be done annually for safe canning results! Who can be a UCCE Master Food Preserver volunteer? Residents of Amador, Calaveras or El Dorado County who have an interest teaching others about food preservation and food safety can apply to become a Master Food Preserver. The certification training program is given each year. MFPs group picture at outreach event. Close up of food preservation at public education class. Honored at BOS Meeting for longevity in the program. Master Food Preservers at the County Fair.